Polypropylene (PP) is a material that is used in a variety of applications like packaging, automotive industry, furniture, et cetera. For use in 3D printing however, it is not nearly as popular as PLA, ABS or PETG. This might be because PP filament is not readily available at most resellers. Also, it is difficult to find information online about requirements for the printer and process settings which would be needed for a successful print. In this article I will share my 3D printing experiences with the 1.75 mm PP filament made by Verbatim and hope to shed some light on how to print this material on a typical 3D printer (heated bed required!). Verbatim recently added this material to their lineup and it is available in 1.75 and 3 mm diameters. The filament can be ordered directly from their website www.verbatim.com. Scroll down for the written article and downloads mentioned in the video. PP is very popular because it combines high chemical and heat resistance with desirable material properties like high fatigue resistance and toughness. These mechanical properties make it very suitable for making parts with living hinges. subjecting the material to stress. 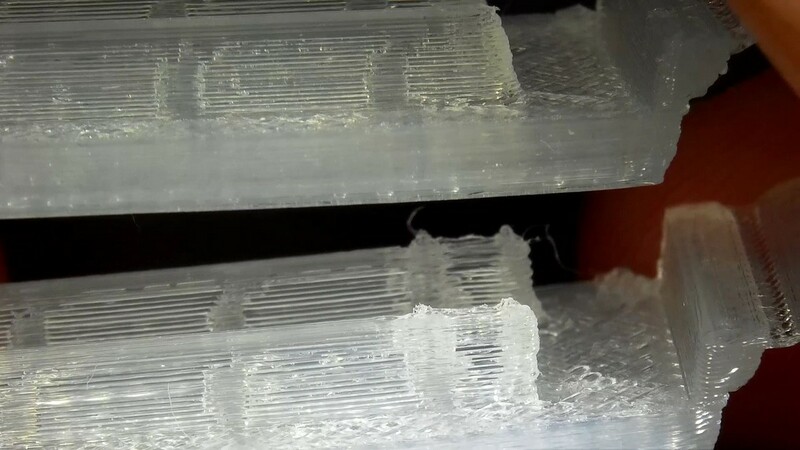 After some initial elastic deformation, the material quickly starts to show plastic deformation. after which the material relies on it’s extremely good fatigue resistance to allow for countless bends without tearing or breaking the material. Verbatim only offers this material in natural transparent filament. 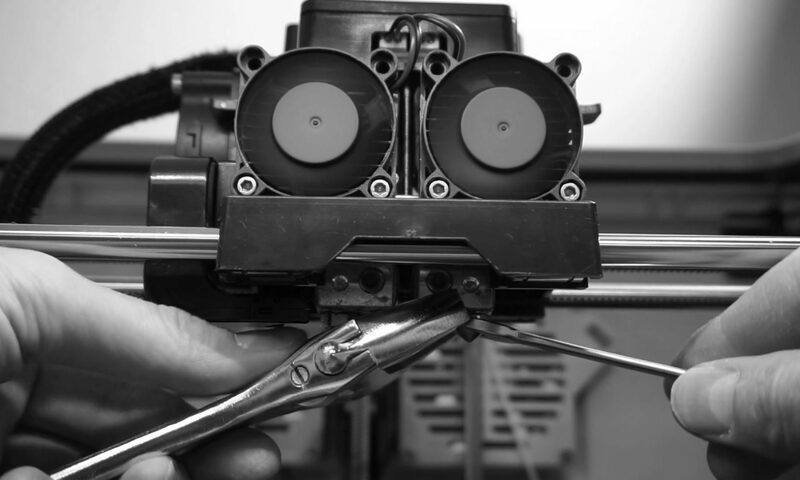 The recommended temperature for the extruder is 220C for the heated bed 100C is recommended. 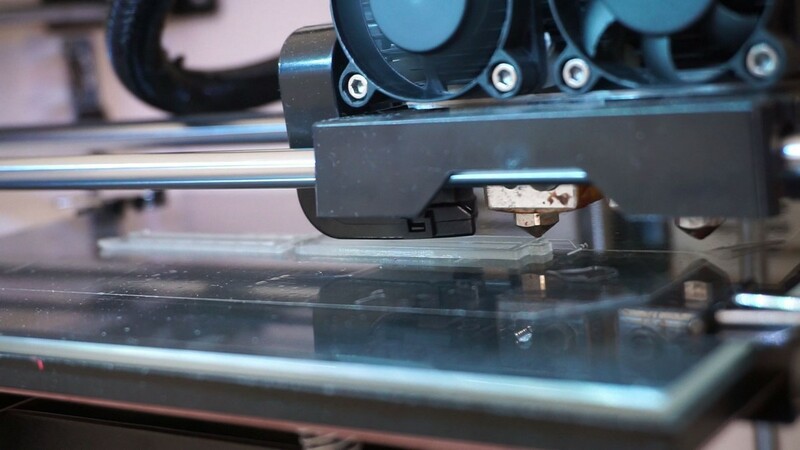 Polypropylene tape can be used on the heated bed to achieve proper adhesion. Verbatim recommends double sided tape, but since I did not have this available I used standard packing tape which is typically made from polypropylene as well. The prints adhere to packing tape very well. 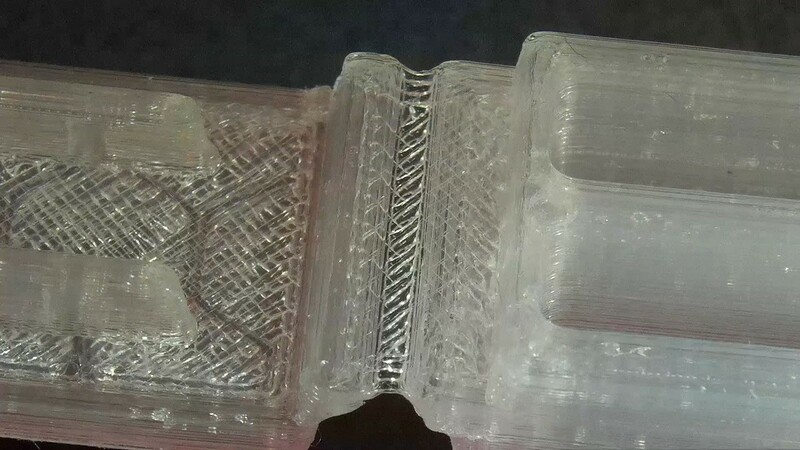 After the print has finished, the parts can be removed with a bit of effort. 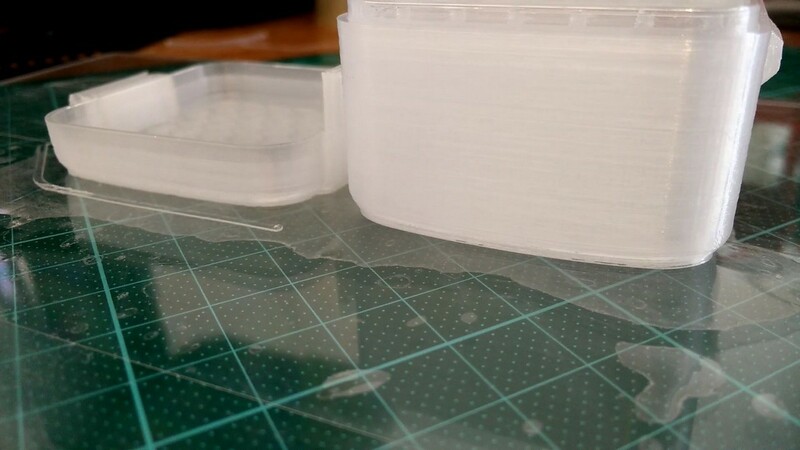 If done carefully, the packing tape can be left in place and reused for the next print. My heated bed is fitted with buildtak, so I use a glass plate to allow me to easily apply and remove tape. The Glass plate adds around 3mm of thickness to the bed. A shim can be used to offset the Z-homing position with the correct distance. For this purpose I printed several shims with slightly a different thickness and used the printer control software to find the correct offset. 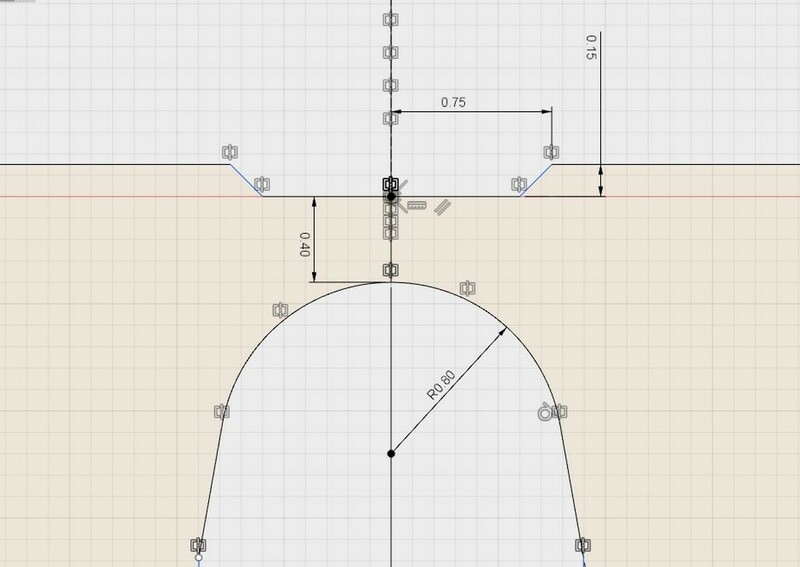 The program allows you to move the Z axis in small increments and find the Z-value at which the micro switch triggers. Note that this shim only fits the first generation of the Flashforge Dreamer. I am using a Flashforge Dreamer from 2014, which is not particularly suitable for printing with flexible materials. Although the verbatim PP filament is not as soft as TPU, it could be described as a semi-flexible material. Aside from all metal hotends I still have the original extruder assembly fitted. 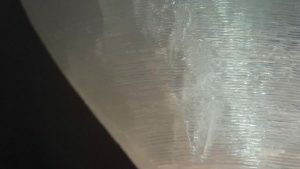 There are mods available for better guiding flexible filament, but it turned out the material extruded without buckling, even at the higher speeds when feeding material, so I decided to give it a try. When printing actual parts, there were issues with retractions and higher feed rates, more details later on. One of the most important things I wanted to test with this material was to see if I could print a fully functional living hinge. As a test case for the living hinge I started with a small box, just to test the design geometry. The hinge geometry I used has typical dimensions, as one might also use for an injection molded part. The thinnest section will show plastic deformation when closing the hinge. 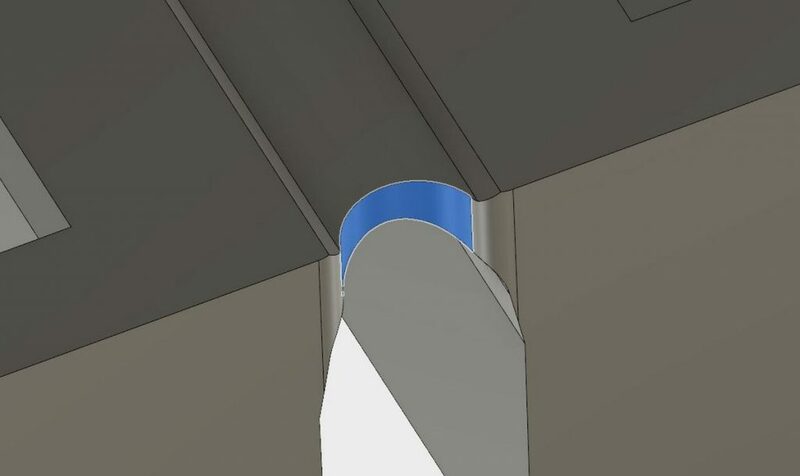 The recessed area, which in this case is 0.15 mm deep, makes sure the part still closes tightly close to the hinge, allowing for some added height from the deformed hinge in the closed position. The thickness at the center of the hinge is 0.4 mm. 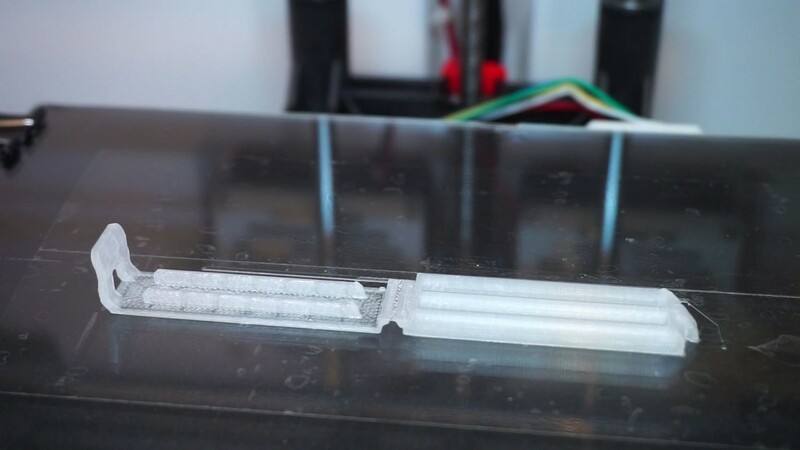 This would mean at the thinnest part of the hinge 2 layers would be used when printing at 200 micron layer height. I used a smaller layer height of 140 microns for this sample print, which resulted in 3 layers for the hinge. The radius at the bottom allows for a gradual increase of stress towards the center of the hinge, while still making sure it bends at the right location. On the sides of the hinge an inward fillet is used to increase tear resistance. The hinge seemed to work fine in the first test. It was possible to bend the hinge 180 degrees and even after many consecutive bends there did not seem to be any sign of fatigue or tearing. The hinge seems to provide less resistance than an injection molded part, especially for the first bend, so there is less plastic deformation than I expected. For testing the hinge geometry on a functional part I designed a bag clip. These type of clips are very useful for closing plastic bags, making them more or less air tight for conserving food. The first print was not a complete success. Cooling was not sufficient at the highest part of the bag clip, resulting in a droopy mess. A possible fix for this would be to print 2 or more bag clips at the same time, allowing the plastic too cool down sufficiently before the next pass. However, I do not like to be forced to print 2 parts when I only need one. Another option was to provide sufficient cooling, which is what I used at the second attempt. This model is printed with the part cooling fan turned on, which gives much better results. I did keep the lid on the build chamber to minimize the chance of warping. In the various test prints extruder temperatures between 190C and 220C were used, all of which seemed to work well. The bed temperature was set to 50C, which is lower than the recommended temperature of 100C, but it worked fine for this part. For larger parts higher bed temperatures could be beneficial. The feed rate was set to 30 mm/sec, which is quite slow, but it gives far better results than 50 mm/sec. 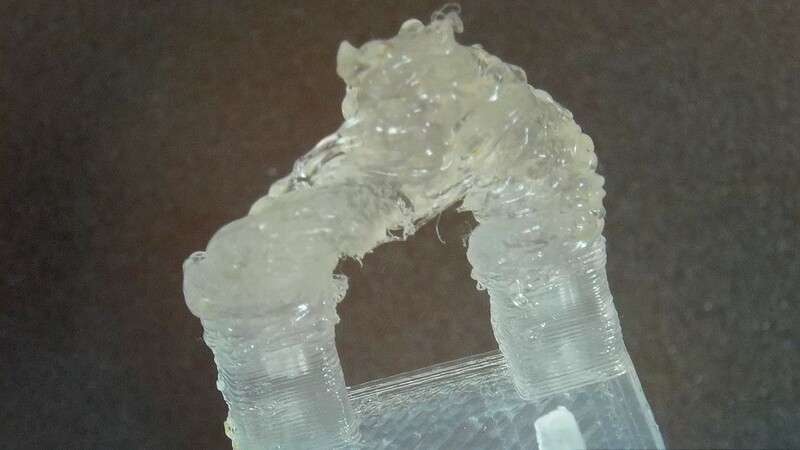 A printer better suited to printing flexible materials might be able to achieve good print quality at higher speeds. Because the bag clip itself was positioned in line with the X-axis, the hinge was printed at 45 degree angles, which were perpendicular to each other for each new layer. Although this setup was accidental and caused by the default infill angle of Flashprint, it actually works quite well. When viewed under a microscope the 45 degree angle almost looks like a braided piece of fabric. The radius on the side of the hinge for the increased tear resistance is copied quite well from the CAD design to the part. Even at larger overhangs the part still shows reasonable print quality. 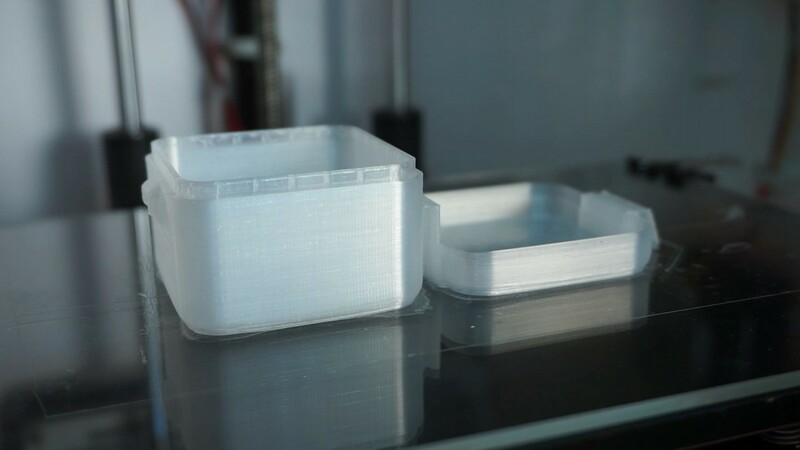 Although I think the design can still be improved, the current version works quite well and is a nice showcase for useful prints made from Polypropylene. Of course I also printed the inevitable Benchy. The settings for this model were 220C extrusion tempaterature, 50C bed temperature and 140 micron layer height. This is a good example of how the printing speed affects the surface quality as mentioned earlier. 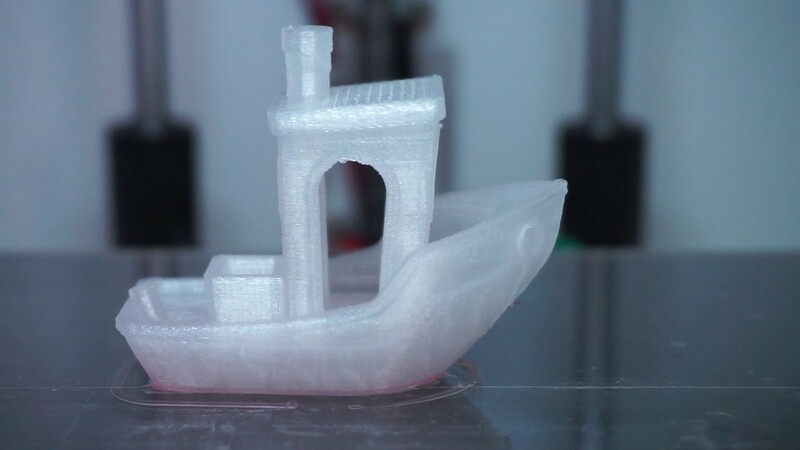 When pinted at 50 mm/sec the front of the benchy, where there is a steep overhang, the print quality was not really acceptable. The Benchy printed at 30 mm/sec has a significantly improved surface finish. For this reason I decided to stick with the lower printing speed. Both models have a gash on the side of the bow. I think this has to due with retraction. So this may or may not be solved when tweaking retraction settings. Since I did not notice this type of defect on other models I decided to look into this at some point in the future. 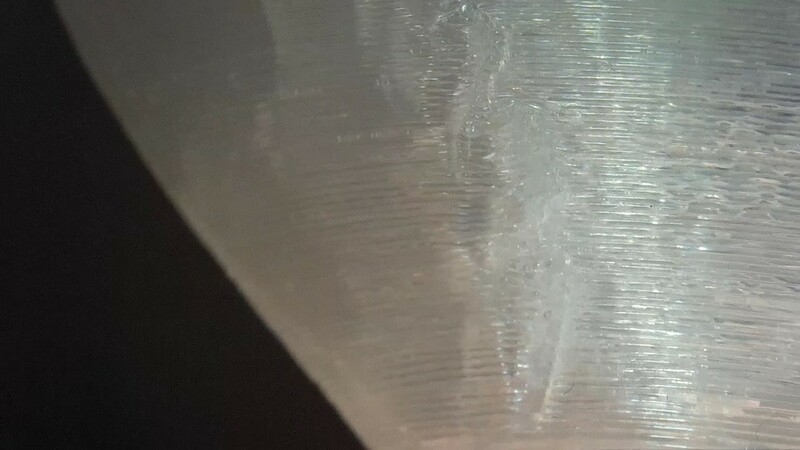 An issue that I noticed on the bag clips, was that the quality of the edges of the parts really suffered when printing at 200 micron layer heights instead of 140 micron. This may be due to the flow rate being higher and therefore harder to control around sharp corners. Also, the 140 micron setting used 3 layers for the walls of the part instead of 2. This would also make it less critical if there are extrusion issues since they are smaller and more easily compensated by the other 2 passes. It demonstrates that it pays off to try various print settings with this material. My next test with this filament was to design a larger box with living hinges. In order to make the hinge open easily without having to deform the entire lid I went for a design with a latch that is also connected using a living hinge. 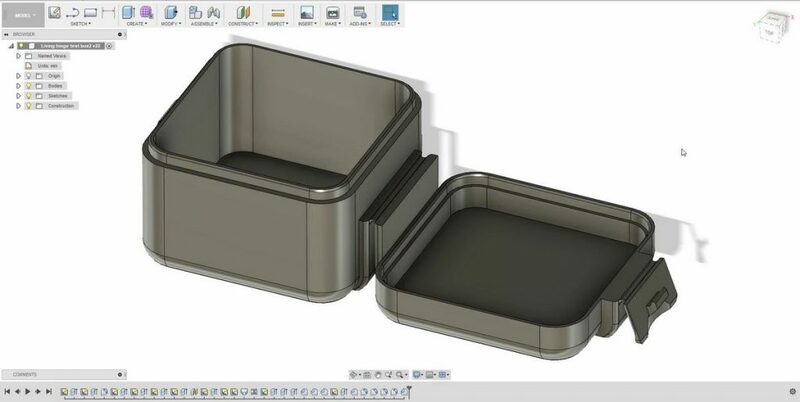 As you can see below in the CAD model, the lid and the hinge are designed in such a way that the entire part can be printed without supports. The box, lid and latch are al touching the bed and the hinges are horizontal. After some design iterations I now have one that works quite well. The locking part only needs some touch-up with a knife and the box closes properly. I did find that for 3D printing I was a bit overenthusiastic with regards to the locking mechanism. 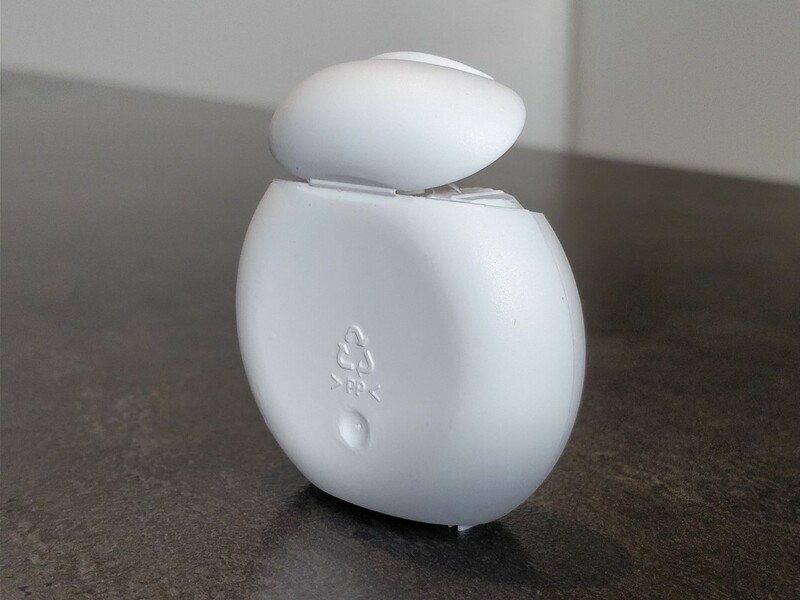 For injection molded parts typically very small notches are used to latch onto the box in order to close it firmly, even with an audible click. 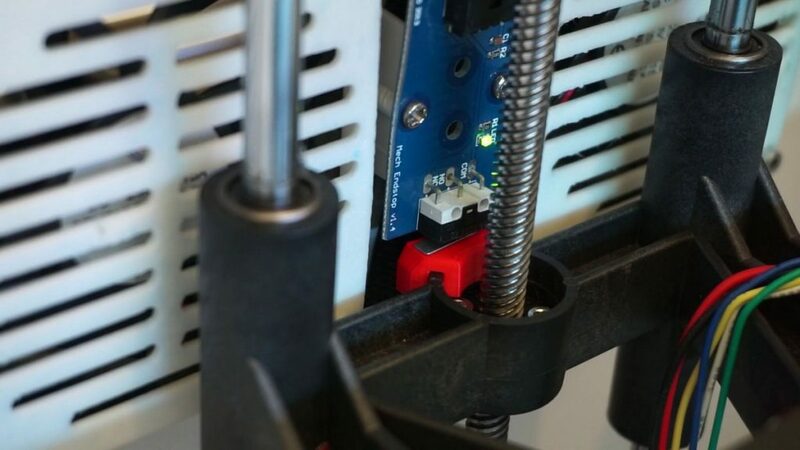 For 3D printed parts the locking geometry should be more simple and larger in order to be able to use the parts straight from the printer without rework. The current model can be downloaded though the link below. Before printing, please note the limitations as mentioned above. I have printed several of these boxes and during this process I found that that having a stable temperature in the build chamber is critical. My Flashforge Dreamer has spacers between the housing of the printer and the lid. This caused a draft inside the printer when I had the window open on a windy day, which in turn caused some heavy warping on one side of the part. So, this is something to keep in mind when printing with this material. Make sure you have enough ventilation for health reasons, but also in a way that it does not create a draft that could ruin your print. 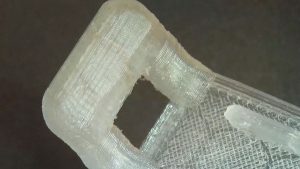 Based on my first experiences with the Verbatim Polypropylene filament it seems to be be very useful for printing functional parts, but it may take some trial and error to get good results on a typical 3D printer. 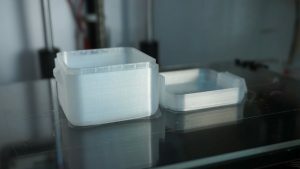 If you are planning to use Polypropylene for 3D printing, I hope the information in this article provides useful information to use the material for your own projects. If you have any questions to ask or best practices to share, please do so in the comments below. Hi Vito, I had issues uploading the fusion 360 file format to the site so I just sent them by email. Nice and informative review. Do you have experience with larger pieces with this filament? Although these are great models, most of them represent really small scale testing for this filament. I would expect that the residual stresses scale up with the model dimensions, and at some point the tape is not enough for the adhesion. And solid infill would increase the amount of warping as well, I assume. Thanks for your comments. I have not printed larger parts with polypropylene, but as you mention it would probably be more challenging with increasing part size. As you may know, the Flashforge Dreamer does not have an actively heated chamber, but relies on the heat generated by the bed. It might be less critical for printers with am actively heated chamber, but for the smaller prints I have done so far with PP the Dreamer works fine. There may also be better options than cheap packing tape for bed adhesion, but I haven’t investigated alternatives yet since it works well so far (again for smaller parts). If I do end up printing larger parts I will update the post.